President Joko “Jokowi” Widodo has called on the public not to underestimate the recent deal agreed between the government and US mining giant Freeport-McMoRan, which he believes is a breakthrough in the final stages toward divesting 51 percent of PT Freeport Indonesia’s (PTFI) shares. 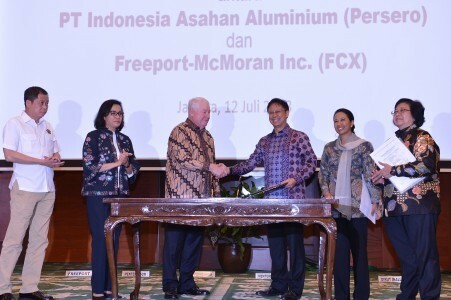 The President was referring to the heads of agreement (HoA) that the government, represented by state-owned mining holding company PT Indonesia Asahan Aluminium (Inalum), had signed on July 12 with Freeport-McMoRan. “This was [the result of] a long process that took three and a half to four years to complete, and it was a tough negotiation. Hence, the HoA is big step [toward divestment] and we should be grateful,” he said on Monday at the State Palace in Jakarta. Jokowi was responding to criticism from experts that accused the government of “overselling” the deal to the public, which could mislead them. The President further said that Thursday’s HoA was the government’s first step toward becoming the majority shareholder of PTFI, which manages Papua’s Grasberg mine, the world’s largest operating gold mine. However, Jokowi did not give a clear answer when asked whether the deal was binding or not, replying only that “it is a process”. Separately, the Anglo-Australian miner whose participating interest is included in the divestment, stated clearly in its press release last week that the HoA was a non-binding agreement and that a binding one was expected to be signed before the yearend.